Thanks to dear friend and local arts community maven, Evy Warshawski, the Quake Mosaic was on the front page of the Napa Regsiter this week! In one day we were able to work with new members of the community in two special workshops. Tonight at the Napa Valley Wine Train Station, Jamie Graff from Nimbus Arts will give a brief update about the Quake Mosaic at the RAD Open House Event. Come join us and hear all about the project and all the newest developments for the Rail Arts District! We are thrilled to announce that the project has received an Arts + Culture Special Projects Grant from Napa County this fall! In partnership with Nimbus Arts, the Napa Quake Mosaic received $25k. This funding will support the site prep work, continued material collection and community outreach that we will be doing over the next year. After the wildfires this past October, we have had to shift focus and broaden the scope of the project. Several items have been donated by artists and friends who lost their homes and studios. We will continue to collect these donations and rework the mosaic design and timeline to incorporate them fully. 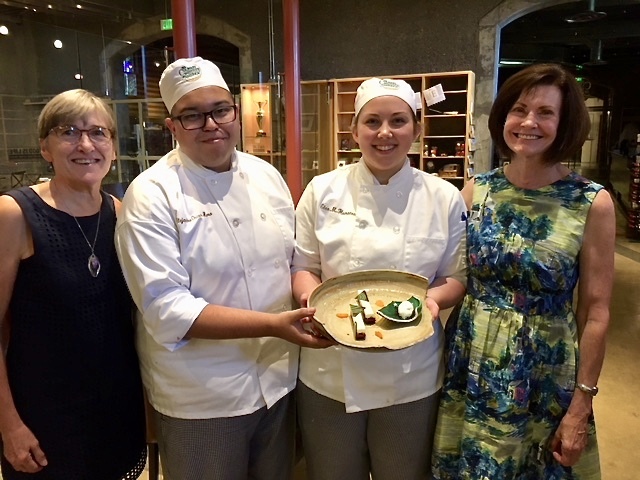 About a month ago, pastry chef and Culinary Institute of America professor Stephen Durfee contacted me about participating in a project he was doing with his students. Each year he pairs his pastry students with local artists so they can create a dessert inspired by the artist's work. So instead of bringing them to my half finish art studio, I decided to share the Quake Mosaic with them. I met the adorable and talented Nicole, Dana and Natalie at the Wine Train yard where all of the mosaic materials are being stored. We discussed the project and the were so enthusiastic and excited to work together. They even took some of the broken pieces of a couple plates with them to use in their creation. I was super excited to hear about the other incredible artists they had selected for this project: Chelsea Ritter-Soronen of Chalk Riot, Mikey Kelly, Freeman Tanner and Patty Wessman, all longtime friends and active members of our local art community. Each artist was paired with 2-3 pastry students and they results were incredible! Delicious creation that Dana, Natalie and Nicole made using actual broken donations from community members. Photo by Infinity Visuals. Students presenting their work inspired by Mikey Kelly's sculpture and drawings. Photo by Infinity Visuals. A second dessert (!) by Dana, Nicole and Natalie inspired by the Quake Mosaic. Notice the 'train tracks'? Photo by Infinity Visuals. My individual plate for the second dessert. Beautiful! Photo by Infinity Visuals. Another inspiring day with the next generation. When Jessica de Lasaux (longtime RADnapa cohort) and I reached out to our talented friend, Gretchen Stranzl McCann of GSM landscape architecture, inc., to talk to her about what it would take to create a living roof, she had a ton of great ideas. She also thought this would be a perfect case study for her class of students at Cal Poly, where she is also an adjunct professor. So a few months later, Jessica and I made a visit to the campus and were blown away by what this group had come up with for the site. They had gone way beyond the living roof and designed the entire parcel, complete with irrigation diagrams, landscaping + hardscape ideas as well as grading plans. The class had so many great ideas and ways to make the landscape plan efficient, inviting and exciting. Jessica and I gave feedback and made a short list of the work we thought we could hopefully incorporate into the final design. These drawings will be on display on the Wine Train station's upcoming "RAD Napa Wall", which will highlight completed and in-progress projects. What an amazing day working with students from Napa's New Technology High School and their teacher, the wonderful Margaret Dennett! We made it through the bulk of the materials and specifically focused on sorting through the beautiful seconds donated from Heath Ceramics. 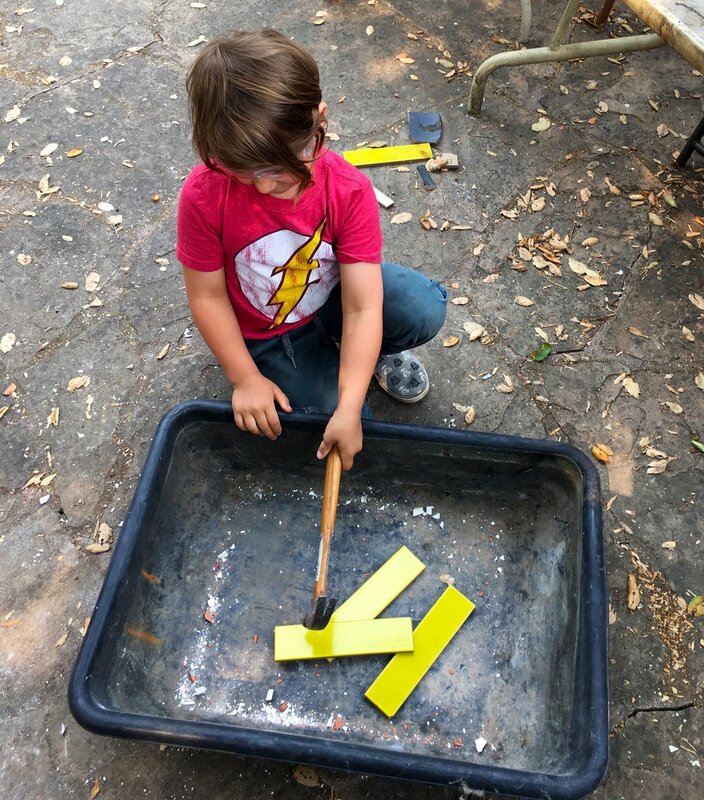 Several students also worked on sanding the edges of the sharper broken pieces so they will be safe for the public to touch when they are used in the final mosaic. Special thanks to Art Teacher Margaret Dennet for reaching out and bringing her students down to help for the morning. Here are a couple of (unedited) student interviews shot by Israel Valencia. Amazing. Thank you so much to the volunteers who came down to help us sort through the many donations for the Quake Mosaic on April 30 as part of FLOW: Arts at the River! We got through several hundred pounds of material, way more than I even thought possible in one day. Major thanks to Azalea Aguilar's AP Spanish Comp + Lit students from Vintage High School, who blasted through the bulk of it in the morning. And an extra special thanks to Jen Sarkisian, Andrew Watt and Gary Oliveras for all of your muscle and support throughout the day! Thanks also to Danielle Smith and everyone at Arts Council Napa Valley for all of your hard work to make FLOW happen! Special cameo appearance by 2 frogs and 1 scorpion who'd been somehow hiding out in the cardboard boxes with the donations all winter! All were rescued and placed in much more safe and luxurious accommodations near the Napa River.